In 1967 the mysterious Mothman was seen flitting about the Point Pleasant area, just before the Silver Bridge across the Ohio River collapsed, killing 46 people. After the collapse, the Mothman sightings ceased. Some believed the Mothman came to warn about the tragic disaster. Now, the Moth man has been spotted again, flitting about coalfield bridges that are groaning under the weight of overloaded coal trucks. Is the Mothman trying to send another warning? An OVEC member and her camera happened to be in the right place at the right time. See the exclusive OVEC photos for yourself, below, and you decide what message Mothman is trying to tell us now. 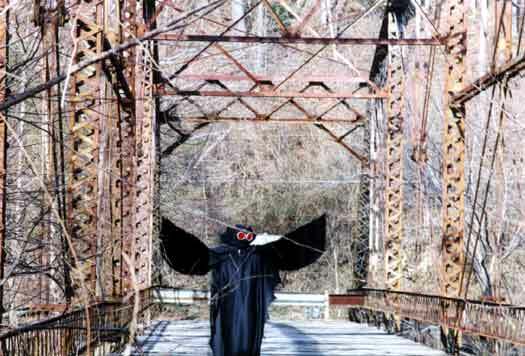 Follow the links in the sidebar for pictures of other bridges the Mothman may have to visit next. Photoshopped, and badly at that. In the first picture, he appears simultaneously in front of and behind the railing. In both the first and second pictures, he looks too "clean". It's just not lifelike. The "red eyes" especially give it away, and look like goggles. did you think these were real? 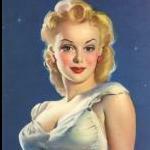 I hate getting into arguments with stupid people; they drag me down to their level and beat me with experience. In case you didn't get it (which you obviously didn't), it's a joke. Someone took that seriously? It's look like a very bad 50's B movie monster. It didn't even look THAT good! Why wouldn't one take these pictures seriously????? No doubt this cryptid is now declassified to phenomenon. Finallly !!! HARD evidence Mothman exists. I just enjoy overkill. I'm one of those folks that goes "But why would a Rabbi walk into a bar anyways?". My ribs hurt from laughing. Isn't there a humour forum for this crap? If not there should be. Such a waste of bandwidth. I just have one question... ya think those are prescription goggles on Mothboy? I wonder if he can see the cam better? saw the pope transform into the emperor ha ha! i love that! This is the worst fake cryptid photo of the whole humanity history! It may had been done by a 5 years old child. It's simple ridiculous. what i think is weird is that the silver bridge collapsed when it was 40 years old, on u.s. rt. 35, that was when interstate 35 bride in minasoda was built, when the bride in minasoda was built, 40 years later, it collapsed the same way the silver bridge did, which just happend the other day, both route numbers were also 35. Some people also had mentioned that they seen sightings of the mothman shortly before the bridged collapsed that evening the other day!